‘We were all wounded, at wounded knee’. This song from the famous native American rock band Redbone, released in 1973, explains in very few words the universal trauma that’s been caused by the 7th Cavalry at Wounded Knee on december 30 1890. Many across the globe know the name through this number one pop song, but don’t know about the actual historical event. What really took place on that cold winters day in Pine Ridge Reserve, South Dakota. And why is it still given such significance today? Some have referred to the last two weeks of december 1890 as the last days of the Sioux nations (Lakota, Nakota & Dakota tribes). To understand what this means it’s vital to look at the story of Sitting Bull, a Hunkpapa Lakota leader who led the indigenous resistance against the United States government taking over Sioux land against treaty rights. Sitting Bull was killed by Indian agency police on the Standing Rock Reservation during an attempt to arrest him on december 15 1890. The agency feared that the chief would join the banned yet widespread Ghost Dance movement, a spiritual dance which was quite recently incorporated into Indian beliefsystems due to the prophecies connected to it. The Ghost Dance was associated with Wovoka’s prophecy that white expansion would soon end, bring back the great buffalo and bring about peace and prosperity; unifying the Native American people across the Plains. Practice of the dance would reunite the living with their ancestors, bringing about their spirits to fight authorities on behalf of the Sioux nations. Dance had always been a significant part of Native American culture, but it was both this prophecy and the altered stated of consciousness entered during the performance of the Ghost Dance that brought about fear amongst Americans. When general Nelson issued a warning on the threat this dance might pose in 1890, the War department deployed about 7,000 troops to keep the Lakota under controle. When accusations were made of the chief leader of Lakota resistance, Sitting Bull, having offered refuge to Ghost Dancers at the Standing Rock camp, US authorities ushered an arrest. 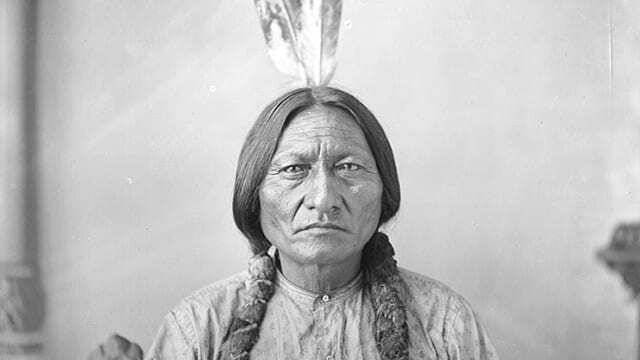 A gun fight ensued as the soldiers dragged Sitting Bull from his cabin and the chief was shot in the head. The death of Sitting Bull marked the end of an important era, an era in which the Lakota had stood their grounds despite famine, decease and highly impoverished conditions in the reserves. Many of Sitting Bull’s followers felt defeated and sought refuge with his former ally and half-brother Chief Spotted Elk (Big Foot). Fearing more arrests, Big Foot decided to take his band of people to the North to gather with other Lakota at Pine Ridge reserve, but the 7th Cavalry found out about their journey. Without any intentions of starting a fight and having retracted a pneumonia along the way, Big Foot waved a white flag. On december 28th, the 7th Cavalry intercepted the Lakota and Big Foot immediately surrendered peacefully with his band, upon which they were taken into custody and put into a camp at Wounded Knee Creek. During the night of 29/30 december, soldiers entered the camp and demanded the Lakota to give up their weapons. One deaf and old member of the tribe refused to drop his gun, after which a firearm discharged. A large gunfight quickly ensued. From a hill above, a Hotchkiss machine gun discharged over the tipis, gun smoke filled the air, and men, women, and children ran for a ravine near the camp, only to be cut down in crossfire. More than 200 Lakota lay dead or dying in the aftermath as well as at least 20 soldiers. Spotted Elk was one of them. For 19th century Americans, the Wounded Knee Massacre marks the end of the Indian resistance and the conquest of the West. For Indians, it represented the total disregard from the US government towards Indian treaty agreements and its cruelty towards Native people. And still today, Indians have not forgotten. In 1973, the year of Redbone’s single release of ‘We were all wounded at Wouned Knee’, two hundred members of the American Indian Movement went back to Wounded Knee Creek to commemorate their fallen ancestors and to demand authorities to live up to treaty obligations. Quickly surrounded by police and federal agents, the protestors were forced into a 71 day standoff that left two natives dead and one agent paralyzed, this ‘battle’ is called the Second Battle of Wounded Knee. However, the name ‘battle’ doesn’t do justice to what happened at Wounded Knee in 1890, but many Americans don’t know about the peaceful intentions of Big Foot and his band had. The shooting in Orlando in 2016 was at the time referred to as ‘the worst shooting in US history’, a tragic shooting which left 49 dead, making clear how easily the role of indigenous people within their history is forgotten. In 2017 the inspiring actions of the Standing Rock Sioux seem to have finally generated some recognition for indigenous defiance and independence, but it’s still a long way to go. Want to read more on the social history of the Wounded Knee Massacre? Visit this page.